West Cork, Ireland, 1900. The year marks the start of a new century, and the birth of three very different women: Kitty Deverill, the flame-haired Anglo-Irish daughter of the castle, Bridie Doyle, the daughter of the Irish cook and Celia Deverill, Kitty's flamboyant English cousin. Together they grow up in the dreamy grounds of the family's grand estate, Castle Deverill. Yet their peaceful way of life is threatened when Ireland's struggle for independence reaches their isolated part of the country. A bastion of British supremacy, the castle itself is in danger of destruction as the war closes in around it, and Kitty, in love with the rebel Jack O'Leary and enflamed by her own sense of patriotism, is torn between loyalty to her Anglo-Irish family and her deep love of Ireland and Jack. Wrenched apart by betrayal, their world turned to ash, the girls' friendship seems all but lost as they are swept to different parts of the globe. Yet, they have one thing in common: a fierce and unwavering longing for Castle Deverill and all the memories contained within it. Review: this was very different to my usual reading material. 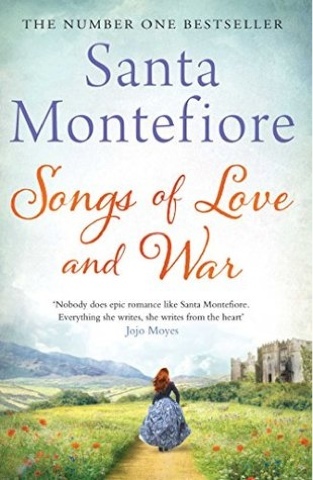 Although I have read a few of Santa Montefiore's books previously, none of them have been quite as 'historical' as this one and so I have to admit I struggled to get into this one a little initially. I think that the thing I struggled with the most was keeping track of who all the characters were and how they related together. The structure of the books was that it was divvied into 3 parts. There was also a prologue and a epilogue. I loved the structure of the book and my favourite part, the part that had me really gripped was the third part. I felt, by this point that I had got to knew the characters and really invested in them so from this pint onwards I couldn't stop listening to it! The characters were an interesting mix of English and Irish during the time when English weren't really welcome in Ireland and it was a fairly dangerous place to be. We also has a mix of the right families and their servants. These characters went through so much drama and created so much drama, I can't really single any one character out as a favourite. I really liked the journey that maid Bridie went on. I won't give away any spoilers but I'm sure you'll be championing her from the start! Of course the setting description in this one was beautiful. The description of the Irish landscape is just breathtaking. Some of the book is set in New York and I could totally picture the scenes as Monterfiore was describing them. There are also so bits set in England and I think that this author really captures the mood at the time in her descriptions. As I say, this book was quite different for me. I enjoyed it overall. I have it in paperback but actually listened to it in audiobook. I'd really quite like the chance to go back to beginning of the book and read the first couple of chapters because the epilogue takes the book full circle, if you read it I would really recommend flicking back to the beginning after you're done!